These are words that one never really wants to hear especially sitting on a beach at 7 a.m. But there we are, me and my best girl, H, sitting on Bonege Beach 2 at 7 a.m., her with a swollen mouth from a jelly fish sting and me with peeing anxiety. Not the most ideal way to end a stay in the Solomons, but not unexpected either. As H (my best girl) learned here, anything and I mean ANYTHING can and does happen. H arrived the Tuesday before, the last to leave the customs room, which is pretty much the size of the Nelson arrivals airport. Its tiny and hilarious and hot. As I see her emerge from the customs room, a wash of emotions sort of come flooding in. H brings an unexpected element to stay here in Honiara. She is the first and only guest I’ve had here and I was both excited and nervous to have her stay here. Don’t get me wrong, it’s o for awesome having her come here but it also leaves me with a sense of slight dread. H is the most supportive person I could have in my life and she walked side by side with me during some pretty dark times, from a sad, heart breaking separation to a city demolishing earthquake. But she also reminds me of how far I’ve come and the zen, super adventurous life I’ve worked hard to achieve. It’s hard not to love H; her enthusiasm and humour are infectious. Her passion for her work (it has something to do with earthquakes and scientists) and her zestiness for a good adventure makes her the perfect companion. It’s no rest for her as we zoom through the main streets of Honiara to Casa Turchese for gin and tonics and a good old fashioned catch up. Mackenzie, my local housemate, makes a fantastic local dish of fish in coconut milk with roasted papaya(!!!). Awesome. The neighbours come over for a nice visit and H begins her life in the Honiara social scene. The next day, we drive along and she looks slightly nervously around. “I still can’t believe you did this, Sara…I mean, it was really ballsy,” she says. I guess I don’t know how to answer. I don’t feel particularly brave or ballsy. I just felt like the universe aligned to help me out and carry me to this place, where I’ve found a really great life. I feel like the luckiest girl alive and H comments about how much happier and together I seem. The next night, we celebrate the International Day of Peace at my friend Katherine’s house, with mediation, yoga and a violence free meal (vegan). It’s all very peaceful and happy and when we leave the house, we feel too zenned out to really talk. H makes her way around Honiara the next day, much more confident than the day before. She begins her process of getting use to the place. I find it a bit challenging because Honiara is home now; everything seems normal and I don’t do the whole “hey isn’t that interesting” thought process anymore. So for me, seeing Honiara through a visitor’s eyes is completely entertaining. We walk around the streets and sort out the weekend’s activities, though not without a bit of work. 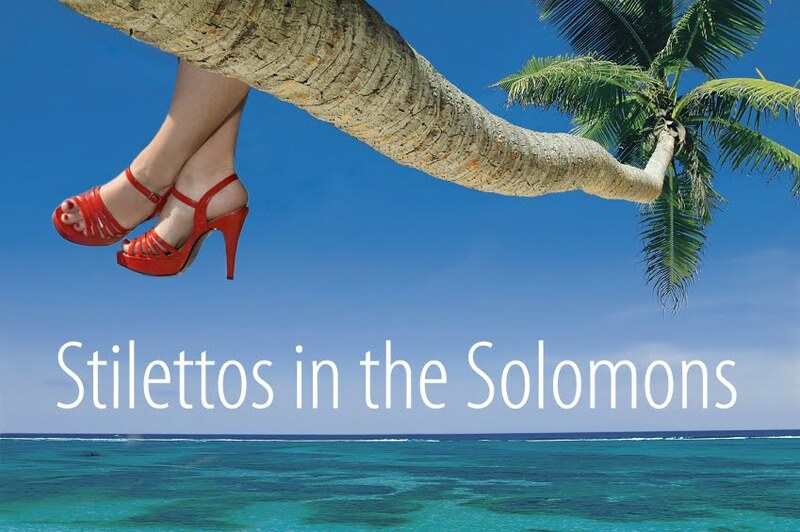 EDITOR'S NOTE: when the Solomon Islands Visitor’s Bureau offers to book something for you, don’t do it! Just grab the number and do it yourself! These guys are pretty useless!!! Anyway, we go out to see my neighbor, Aidan, off. I’m sad to see Aidan leaving; he is a very good neighbor, putting up with our antics and letting us play Band Hero till late. Which H and I do, singing her favorite heavy metal toons until far too late. We can’t stay for as long as either of us would like due to an early morning appointment with the Sun Express to go across to Maravagi, my favorite resort, currently, in Central Province. The ride over is totally unexpected for me. I’m used to bouncing around in banana boats, wondering half the time if we are going sink. But the Sun Express cuts through the rough water quickly and I find myself slightly sea sick, a totally new experience in the Solomons. I guess I’m just a banana boat girl. Anyway, its off to Maravagi. Now usually I jump off the boat just as we get close to the resort but the size of the Sun Express means I can’t. We quickly unload and begin our holiday in earnest. In the afternoon, we snorkel around the home reef, spotting a nice sized black tipped reef shark. Now that I’ve spotted a few of those guys, I understand a bit more how to respond other than swimming in the opposite direction as fast as possible. We eat, snorkel, beach, eat some more and generally have good chats. Maravagi is a great place to just chill out and enjoy the best of the Solomons (although, this weekend I went to Nugu and that was freakin awesome). Anyway, after our two days there, we make our way in a banana boat across the sea to Savo, the lone volcanic island hugging the northwest corner of Guadalcanal. Savo is a totally different place to Maravagi. Blessed or cursed with volcanic activity, it doesn’t have much of a reef to snorkel but it does have other things. We hammock and enjoy the simpler, taster local food than offered at Maravagi. The next morning we wake up early to see a completely unique sight…the Megapodes. Megapodes are little black birds that resemble small chickens, but with better posture. There are several interesting things about megapodes, one being that their eggs are around thirty percent of the size of their torsos. The yolk from the eggs are around 80 percent of the internal parts of the egg, making it yummy for omelets (I know, H and I tried some!). We walk up to an area where some Savo-ites are digging in the black sand. The area is surrounded by a series of fences, covered with coconut fronds, giving privacy to the Megapodes. A small group of Megapodes dig into the black sand. The eggs are incubated in the warm volcanic sands of the islands. After 31 days, the egg hatches and the bird digs its way out, never knowing its mother or father. Anyway, the locals have built up fences around their nesting area to protect them from dogs and to give them a bit of privacy. As H and I pull the leaves of the fence apart, we watch these fascinating little birds chortle at each other. Sometimes, it’s just holes in the ground with dirt flying up in small clumps. The birds make a quiet exit once their eggs are safely laid in the holes. The locals make the signal and it’s a mad dash of digging as they go for the eggs, sand flying everywhere. The eggs are highly priced as a protein source but also sell for about 10 dollars Solomon an egg in Honiara. After about 10 minutes, a good amount of the eggs have been dug out of their nests. The megapods have waddled their way back to their jungle homes, which one local points out to me as being a place that is taboo (sacred) to locals and no one is allowed to visit or disturb them. H and I make our way back to the Sunset Resort, to enjoy a meal of megapod eggs and pineapple. Me likum this post. Especially the part about how fabulous H is.